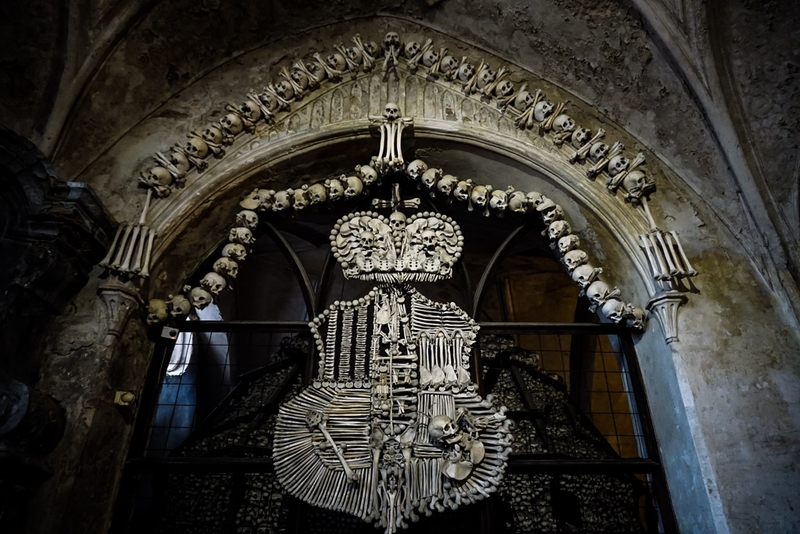 The Sedlec Ossuary resides within a small church in the town of Kutna Hora, just outside of Prague in the Czech Republic. The church looks seemingly ordinary from the outside. Just a small, simple chapel, surrounded by a well-maintained cemetery. Very typical of most other churches in the area. The only exterior sign that this church holds something extraordinary within, are tiny, golden, skull and crossbones adorning the very tip of the church’s awnings. 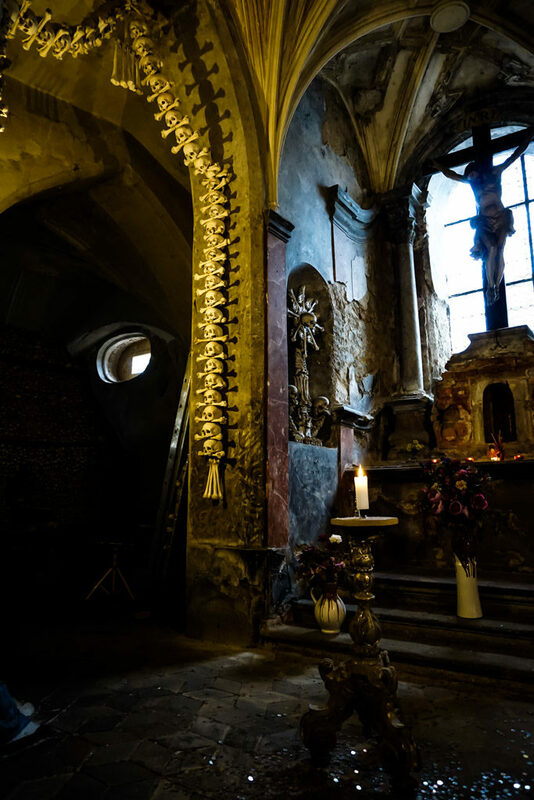 This small chapel in the Czech Republic contains the world famous bone church. 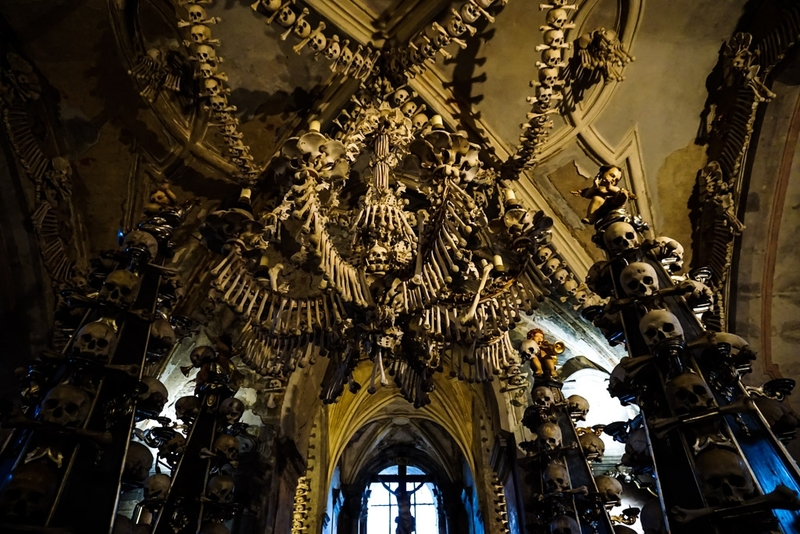 Inside the Sedlec Ossuary, better known as the Bone Church, are elaborate and ornate designs constructed from human bones. It is estimated that the Bone Church holds the remains of somewhere between 40,000-70,000 individuals. Entering the church is awe-inspiring, being immediately greeted by human bones and skulls adorning the high ceilings of the entrance. Descending deeper into the church reveals 4 large, freestanding pyramids meticulously stacked out of human bones. These are presented in patterns with various bone types stacked and laced with skulls around their mid-sections. 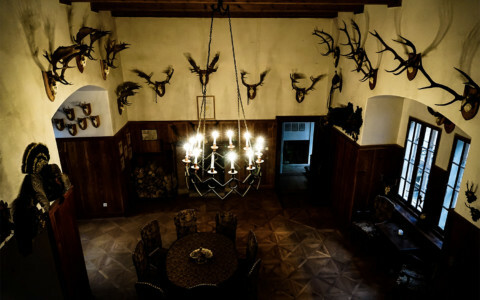 There is also a coat of arms from the Schwarzenberg Family proudly displayed, also created from human bones. Though the most stunning piece of art hangs in the center of the church. Here, a large, intricate chandelier made completely of bones exists. This piece supposedly contains at least one of each bone present in the human body. 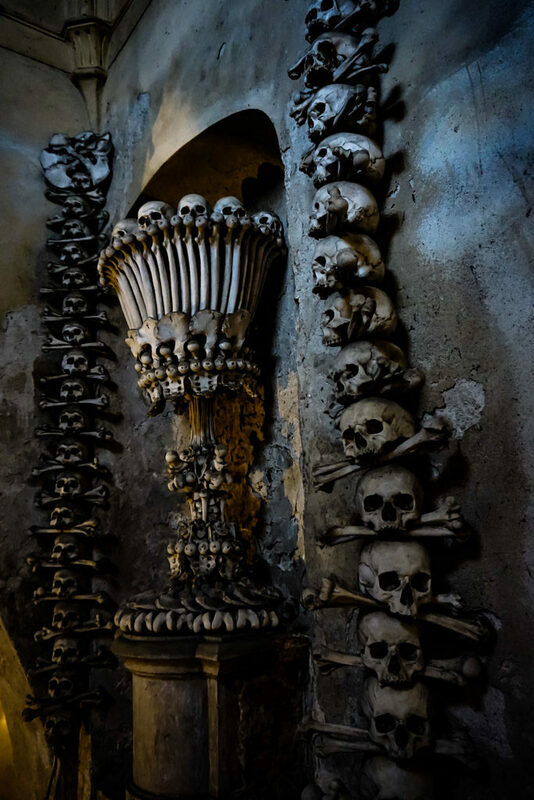 Ornate chandelier made out of human bones inside the Sedlec Ossuary. The Bone Church is certainly an interesting place and has an equally interesting history explaining its existence. 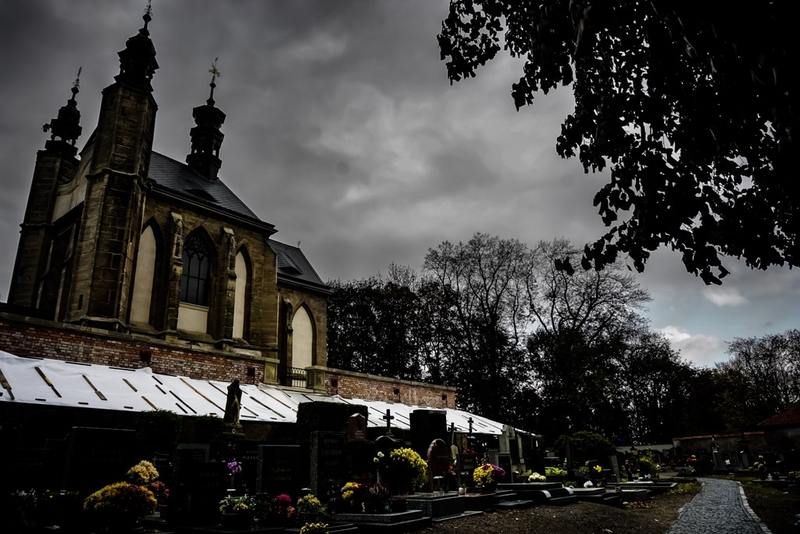 The Sedlec Ossuary’s story begins back in the 13th century. During this time a local Abbott made the pilgrimage to visit the holy land in Jerusalem. Upon his return, he sprinkled soil he had brought with him from the holy land across the local cemetery. This lead to the small burial plot being an extremely sought after place to be buried. Rows of skulls and crossbones lining the walls next to an altar. Later, the plague swept through Europe and great battles resulted in vast amounts of fatalities. This small cemetery was consequently inundated with interments. It didn’t take long before the cemetery began to overflow. To counteract this, bodies and skeletons were exhumed. These were stored in a gothic church built during the 1400s. This church was specifically built for the purpose of becoming an ossuary. Eventually, a half-blind monk was given the task of exhuming bodies, cleaning the remains and stacking them. Human skulls inside the church. The elaborately artistic bone formations didn’t come about until the late 1800s. It was at this time a woodcarver was hired to create order to the piles of bones within the church. He then proceeded to create great art pieces using these remains. This ossuary contains somewhere between 40,000-70,000 human remains. 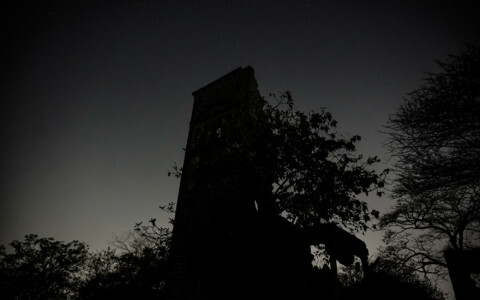 The bone church remains as a macabre omen to the vast amount of death experienced in this small town. Though, in a way, it has helped to breathe new life into the town. Attracting thousands of tourists each year. It has even served as inspiration throughout pop culture. 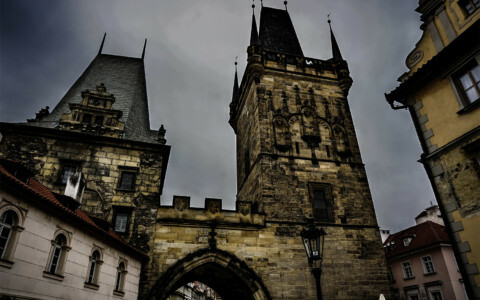 It supposedly served as an inspiration for Dr. Satan’s Lair in Rob Zombie’s horror movie House of 1000 Corpses. 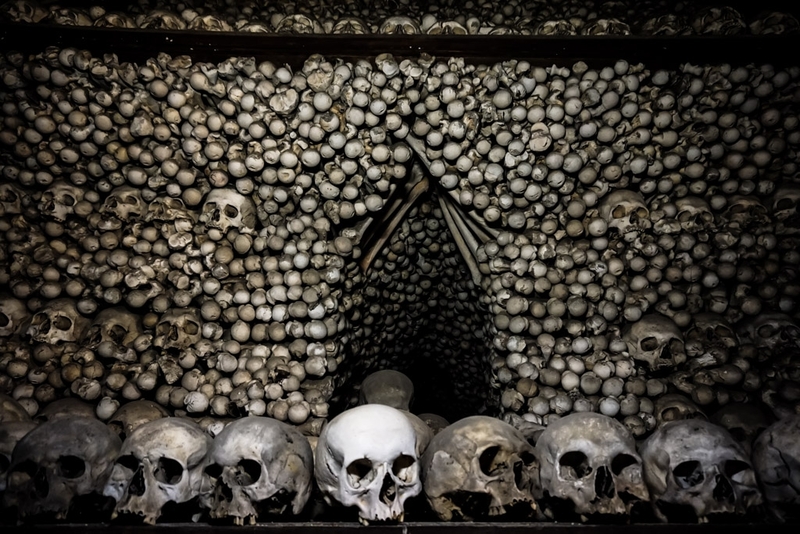 One of the bone pyramids stacked neatly inside the ossuary. 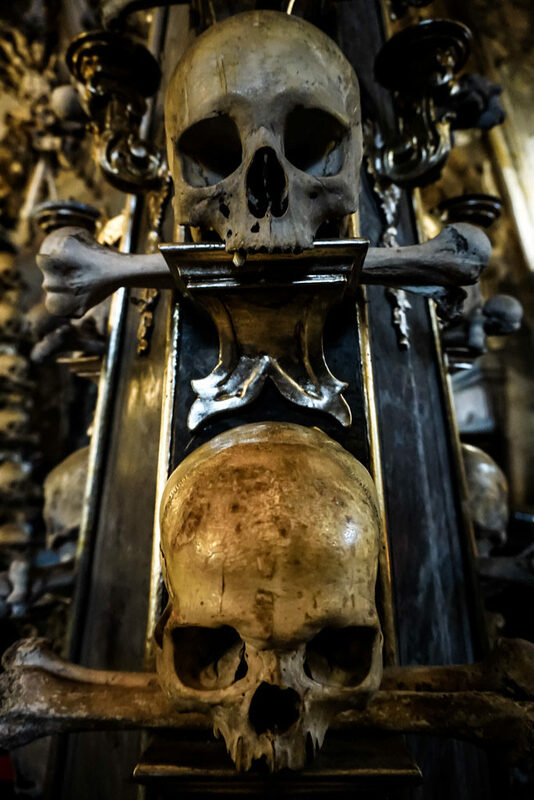 The Sedlec Ossuary is a truly interesting and inspiring place to visit. It is equal parts creepy and beautiful. It is also easily accessible to tourists too! Trains to Kutna Hora from Prague exist. From the train station, the Bone Church is a short walk. Directive arrows spray painted on the footpath will lead you straight to the church. The church charges a small entrance fee. Visitors can then peruse the displays at their own leisure. Coat of arms made entirely of human bones. If you want to read about other places with exposed skeletons. You will certainly enjoy the La Noria Cemetery in Chile. Love the photos. Very interesting place. Thanks for sharing this information. You’re welcome. Thank you so much for reading my article.